Hot Toys has always been a big fan of the iconic Star Wars saga and is thrilled to announce the official right to manufacture collectibles from the Star Wars universe this year! Sideshow Collectibles and Hot Toys will be bringing fans a large range of high-end collectibles with movie-accurate details and stunning likenesses! 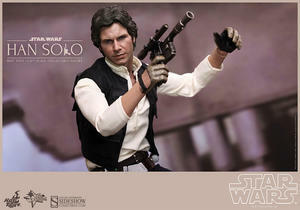 To kick off this incredible series, we are very excited to introduce the sixth scale collectible figure of the infamous smuggler, Han Solo, from Star Wars: Episode IV A New Hope ! 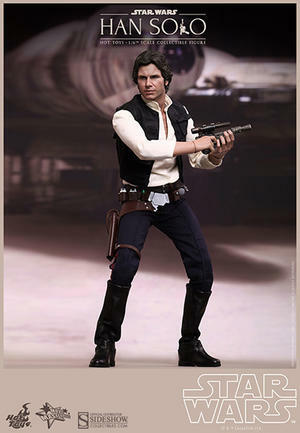 The movie-accurate collectible figure is specially crafted based on the image of Harrison Ford as Han Solo in the film and features a newly developed body, highly detailed costume, weapons, accessories, and a specially designed figure stand. 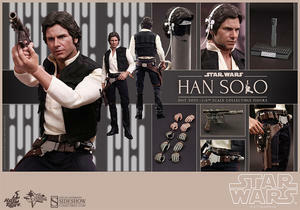 Star Wars fans, don’t miss the opportunity to pre-order this amazing collectible figure!